"Photography is all about light, composition and, most importantly, emotion." Last Blogapalooza 2014, got a chance to meet people from Imagine Nation Photography. 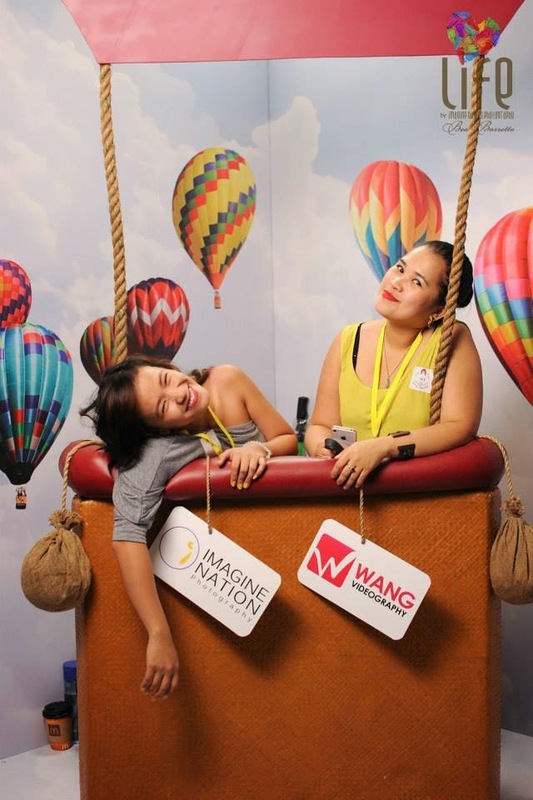 They had this super cute Hot Air Balloon photo booth for all the bloggers. Of course I didn't miss that opportunity to have our picture taken. Imagine Nation Photography is a team of young and creative photographers in pursuit of excellence and perfection in their field because of their huge love for Jesus. They give their best in every shoot because it is only in doing so that they can glorify God. Imagine Nation started in 2003, from just 11 weddings on the 1st year, they shot 79 on the 2nd and in 2006 – 165 weddings! This gave inspiration to the idea of an apprenticeship program where photographer’s talent and career will be managed so the photographer can concentrate on shooting. It was also during this year that founder John Mateos Ong met Jesus and pursued a higher purpose than just shooting for passion. With that being said, the group is highlighting the fact that they shoot not to impress but to serve. They believed that if they are giving their best, they are also giving their best to the Lord. It's their way of life. It's refreshing to know that such group have a mission in glorifying God. The team of course is very serious in terms of photography inspired by their purpose. Imagine Nation Photography covers all types of events. Including Wedding Photography, Life Photography, Corporate and Advertising and Videography. Imagine Nation Photography believes that the relationship between a Man and a Woman is planned by God. And that their mission is to help put Jesus in the center of their marriage. Imagine Nation Photography can take your family picture to the next level. Capturing those precious moments with your loved one. Imagine Nation Photography do not captures pictures of businessman and products alone. They let their visuals recognize by people and make the acquaintance of the professionals running your company. A group of senior videographers from Imagine Nation Photography dreams to produce a more personal videos that's why Wang Videography was born. At Imagine Nation Photography, all photographers have their own uniqueness in terms of getting your images. But all share the same passion in capturing client's memorable events. Currently, they have 4 Master photographers, 2 Senior photographers & 6 Junior photographers. So you have a number of photographers to choose from. Photographers also do not depend on magic of photo editing. They believed that emotions are best captured if they are unedited and you will feel fresh on every photo, making it more significant. They are also providing other aspiring photographers to learn by conducting workshops. Overall Imagine Nation Photography is passionate about Photography. And also their purpose that drives them to shoots is for the Lord. In the end, what makes the product precious is not the style but what the artist/photographer puts into his craft and how much love he put on it. A picture is beautiful not just because of the artist. A picture is beautiful because HE makes it so. If given a chance to win I would be so thrilled to have them capture the best moments of my twins. Because of their passion and purpose, it's guaranteed that they will not just take images of my twins, but will leave the best memories for us. Maaga pa kasi yan. Kaloka si Neri diba? haha.. humandusay. Ha Ha Ha uo nga sana pa wakyhan na lang ng pic eh!